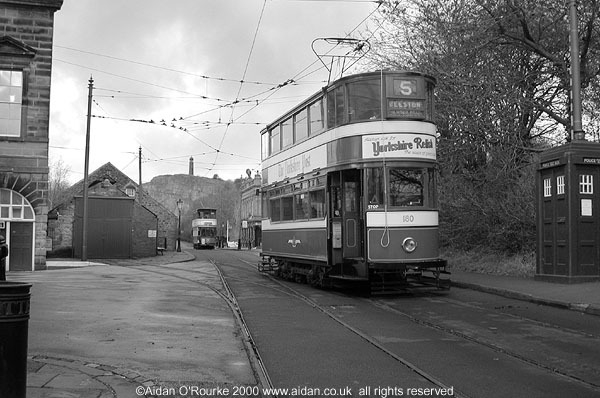 THE NATIONAL TRAMWAY MUSEUM, situated in Crich, Derbyshire has a remarkable collection of fully working trams. 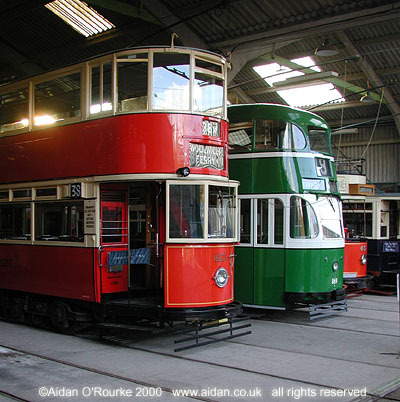 In this pair of pictures, we see ex London and Liverpool trams parked in the depot. The shiny red and green painted metal exteriors make an irresistable colour combination. THE NATIONAL TRAMWAY MUSEUM recreates the look of an era that ended around the 1950's, when trams were withdrawn from nearly all of Britain's cities and towns. Shelters, police boxes, signs, even whole buildings have been relocated here. The building on the left, formerly the Assembly Rooms in Derby, was demolished and rebuilt here brick by brick. The National Tramway Museum was developed from a former quarry, not the most ideal location, but it provided rails for the trams to run on. Buildings have been added to create the effect of a streetscape from yesteryear. 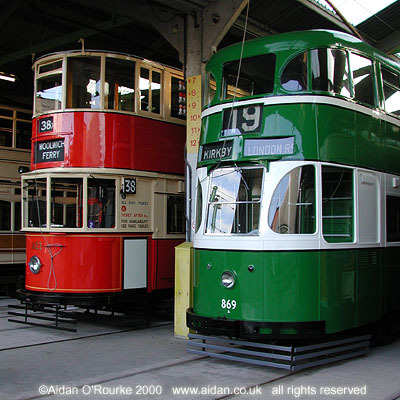 The National Tramway Museum is of great interest to people from Manchester, as there are exhibits and documentary materials relating to Manchester's tram network, both past and present. 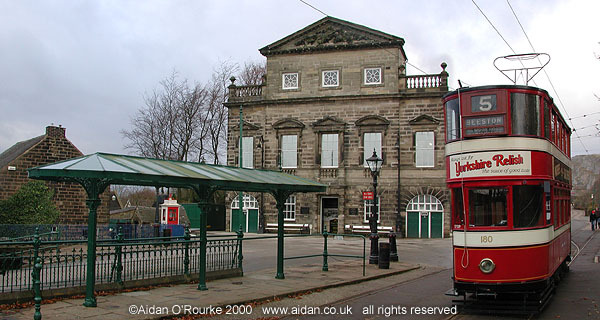 MANCHESTER'S TRAM MUSEUM is in Heaton Park. 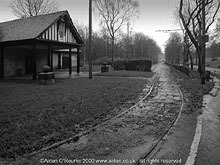 A vintage tram car runs between the Middleton Road entrance to a point near the boating lake, but only during the summer months. At this time of year, and in this weather, most of the park is deserted, apart from a few people walking their dogs, and the occasional drenched photographer! 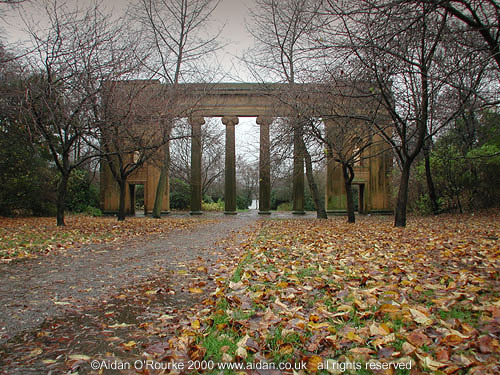 THE COLONNADE OF THE FORMER TOWN HALL, Heaton Park, looks mysterious and imposing during a heavy downpour on the afternoon of Saturday 25 November 2000. The colonnade is taken from Manchester's first town hall, which stood on the corner of King Street and Cross Street on the site of Lloyds Bank. The building was designed by Francis Goodwin in the Greek style, based on the Erechtheion in Athens, and was completed in 1825. It was first occupied by the police commissioners, and from 1838, the newly formed town council. When the Corporation moved into the present Town Hall in 1877, the building became a reference library until it was demolished in 1911. Following a campaign by the noted Manchester-based architect Edgar Wood, the central part of the facade was salvaged and re-erected here. 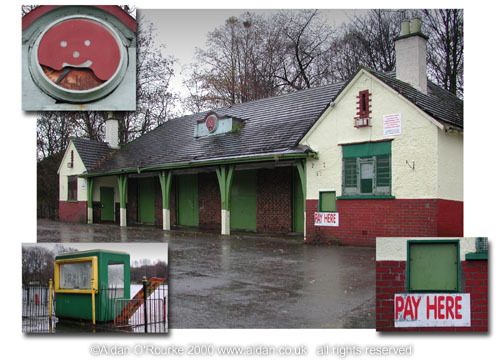 Eyewitness says: How could Manchester City Council have allowed one of their prime public amenities to deteriorate into this condition? 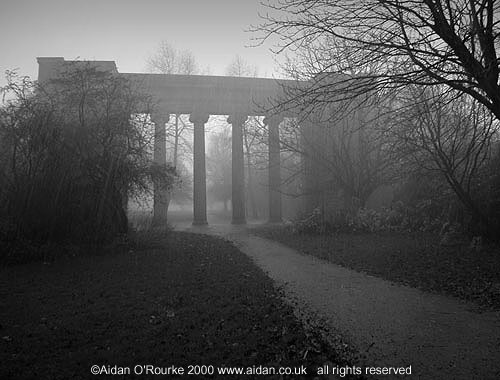 There's no reason why Heaton Park can't be as well maintained as St James's Park in London, or the Bois de Boulogne in Paris, if local and central government do their job properly. Only when amenities throughout the city are properly maintained, not just those in the centre or on the Commonwealth Games site, can Manchester call itself a 'world class city'. 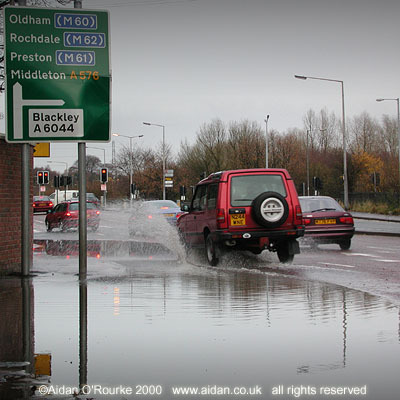 HEAVY RAIN FELL AGAIN on Manchester and the rest of the UK during late November 2000. Here we see water which has collected outside the main entrance of Heaton Park on Middleton Road. The bus stop lay by has become a pond, and is unusuable. We can be thankful that flooding in Manchester is relatively minor nowadays, unlike parts of Yorkshire which has seen some of the worst flooding on record. WE ARE ON BURY NEW ROAD, looking towards the city centre. On the corner which used to be occupied by the Rialto Cinema, a brand new McDonalds restaurant has recently opened. Compare this scene with the one taken earlier in the year, after the cinema was demolished. Which is better, a cinema preserved, but empty and unused, or a McDonalds restaurant - of no value froma heritage point of view, but a good provider of employment for local people? I'm looking for a photograph of the cinema before demolition - can anyone help?